So Christmas is over and although we did bring back a lot of cold meats and Christmas soup – which will keep us going for lunches into the new year – it feels like it’s time to have a break from the turkey and other Christmas leftovers. 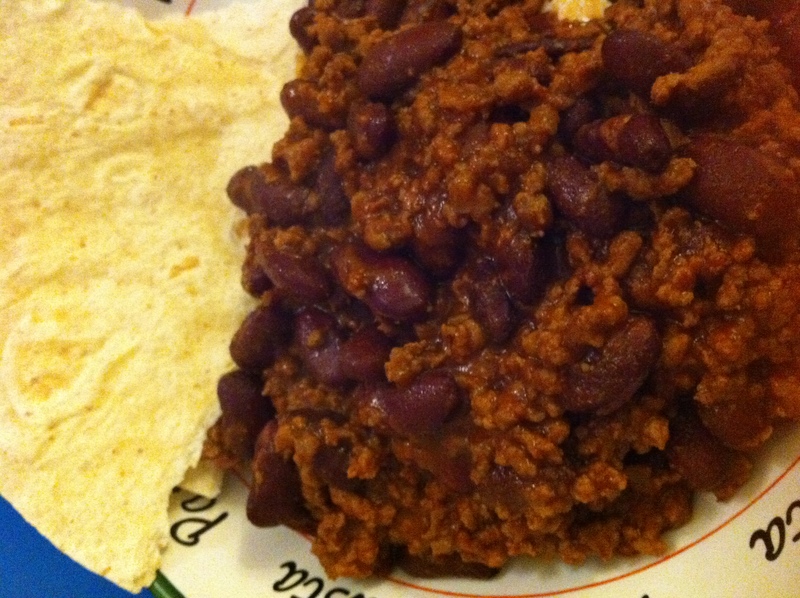 So first on our list of dinners this week is a wonderful warm chilli which I’d thought I’d share with you all Ii’m only sorry I haven’t added it here before). First heat some oil in a pan add onions and brown. Next add the mince and brown. Add in a tin of tomato passata along with a tin of kidney beans, chilli powder and cayenne pepper. The amount of spices depends completely on how much heat you like, we tend to be pretty liberal when it comes to the spices. Turn the heat down and leave to simmer for about 20 minutes, occasionally stirring, until the chilli has thickened. Serve immediately. 1. Ladled on top of rice. 2. Piled on top of tortilla chips with salsa, guacamole, soured cream and some grated cheese. 3. Served in a bowl with flour tortillas. Use the wraps to scoop up the chilli whilst eating. With Christmas fast approaching we’ve started to do some festive baking. 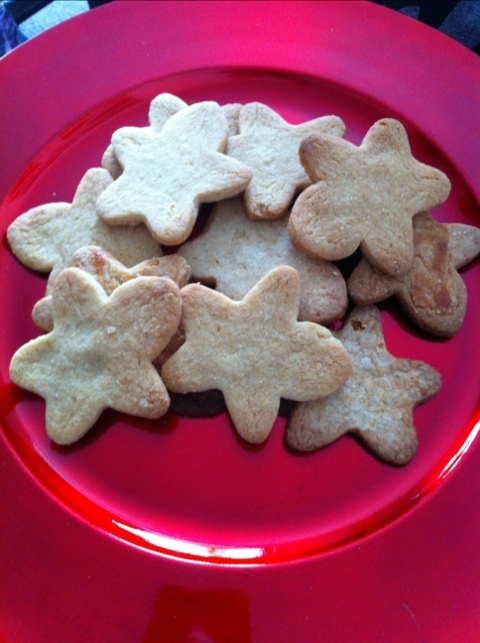 Our first foray (this year) into the world of Christmas yummyness was Gingerbread Stars. This recipe is really easy and bakes tonnes of biscuits – or 45 to be precise. Add the sugar, vanilla extrct, mixed spice, ginger, honey, egg yolk, milk, butter and ground almonds. Bring the mixture together to form a soft dough, by stirring with a wooden spoon. Use your hands to shape into a ball. On a floured surface roll out the dough so it’s about 5mm thick and cut out biscuits. Place on a lined baking tray and brush with beaten egg white. Bake for 8-10 minutes at 180°C or until golden brown. We’re both massive fans of Leon’s Sweet Potato Falafel and have wanted to make this at home for a long time. So finding this recipe was ideal, not only is the falafel yummy it’s also super-easy to make. We usually make a batch of these at the weekend and then eat cold with salad for lunch in the week. Roast the sweet potatoes for 45 minutes until just tender. Once the potatoes have cooled peel off the skins. 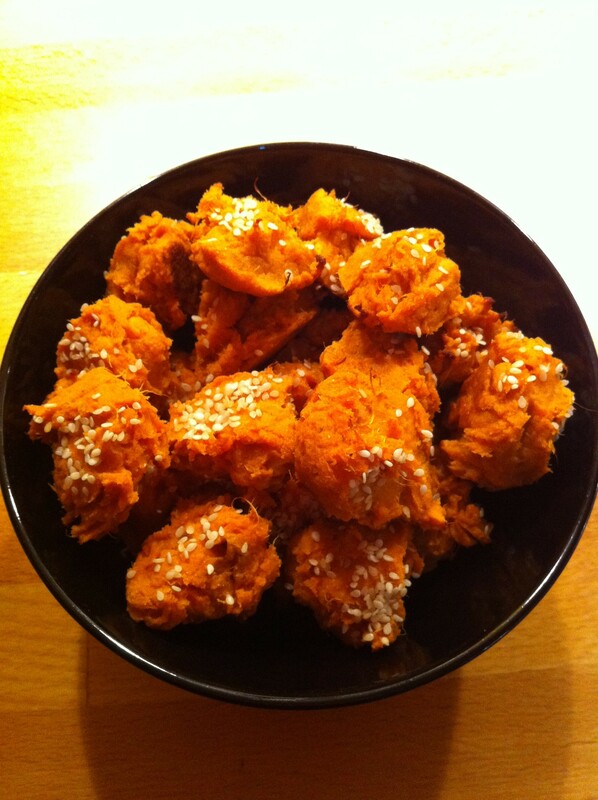 Mash the sweet potatoes, cumin, garlic, corriander, lemon juice and flour in a large bowl and season. Place in the fridge for 1 hour or the freezer for 30 minutes until the mixture firms up. Spoon balls of the mixture onto an oiled tray and form roughly into ball shapes. Bake on 200°C for 15 minutes until golden brown. Serve with salad and a dash of Nando’s Perinaise or pop in a wrap for something different. This is another meal we tend to turn to when we want something quick with little effort but full deliciousness. As this is one of our quick meals we use ready made puff pastry, in my view when there’s cheap ready made options available it doesn’t make sense to spend time making it. Also if I’m honest I’d much rather spend longer baking a cake or trialling a new recipe than spending hours making my own pastry from scratch. Roll out the pastry block on a floured board to roughly 1 cm thickness. Next cut the pastry into your individual tart shapes, you should be able to get four decent rectangle shapes out of one shop bought block. Score a border 1cm inside the edge of the pastry, this will be the edge of your tart. Next get creative with your toppings and spread them inside your scored border. 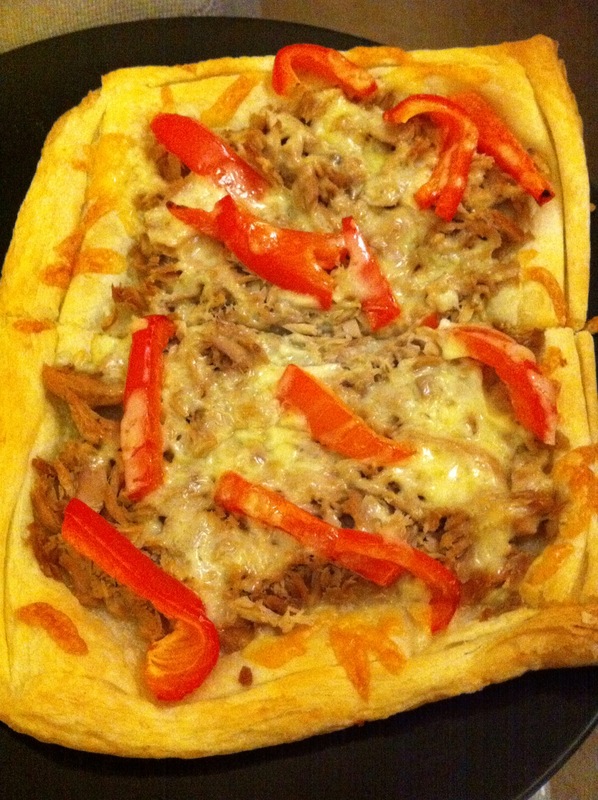 In the picture below we’ve added tuna, peppers and some grated cheese – for us the toppings are usually whatever is left over from that week. For other topping ideas, see below. Bake the tart for between 20-30 mins at about 200 degrees C until the pastry is a golden brown colour. I like to add chilli sauce to my tart before eating. basically any leftovers will work here so play around and find your favourite topping.